There are some hard and fast rules on the responsibilities and skills required of board members and directors of a nonprofit organization. 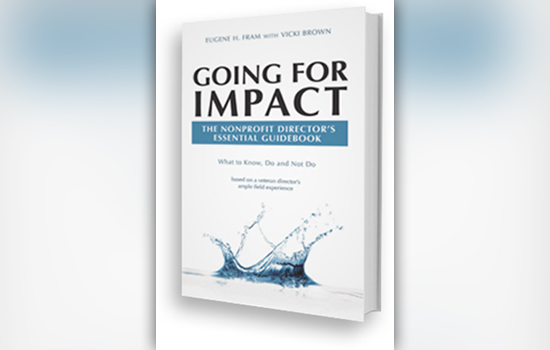 Author Eugene H. Fram (with Vicki Brown) packs a big punch in a little (114-page) book, Going for Impact: The Nonprofit Director’s Essential Guidebook, that is fast becoming a strategic resource for new and experienced executive leaders. The award-winning emeritus business professor from Saunders College of Business at Rochester Institute of Technology tackles 15 topics on “What to Know, Do and Not Do” in areas such as the Intermediate Sanctions Act, avoiding common mistakes that trip up boards, setting the boundary between policy and operations, essential ways nonprofits differ from for-profits, and more. According to Tom Pierce, president of Pierce Management Development, “Reading Going for Impact is like daring to enter that dark mine of Governance…but finding sparkling diamonds that illuminate your way,” he said in an Amazon.com review. The author is a celebrated professor who received the Presidential Medallion from RIT after 51 years of teaching and an endowed $3 million chair in critical thinking named in his honor at the university by a former student. Fram has served on 12 nonprofit boards, is the author of six books, more than 125 published articles, and blogs weekly on nonprofit governance. Besides Fram’s corporate governance expertise, he is a renowned business expert who has expounded on everything from mall space and eBay, to scrapbooking, nonfinancial impacts, corporate governance, Enron and Wal-Mart. His business insights have been heralded across the U.S.—The Wall Street Journal, The New York Times, The Boston Globe, The Washington Post, St. Louis Post-Dispatch, The Sacramento Bee, Money Morning and CNN.com. Going For Impact can be purchased online through Amazon books and from local and chain book stores. For more information, contact Fram at frameugene@gmail.com.